At Bookmans, our mission is to spread the love for books across the state. We present early literacy storytimes at each of our six locations around Arizona. By providing fun and interactive story times for the surrounding communities, our goal is to instill a love of reading in youngsters and grow a new generation of avid readers. A local non-profit organization, First Things First (FTF) believes that literacy is a skill that should be developed before kindergarten. FTF states that “A child’s environment – and the amount of nurturing and care they get from the adults in their lives – shapes their brain development. If you think of the brain as a human skyscraper, a child’s experiences in the early years are how the foundation is built.” With so many amazing books from which to choose, let’s get building. Stop by any Bookmans location for fun, free and interactive weekly storytimes. Bookmans East • Story Time Music Hour • Tuesdays at 10 a.m. Sing, dance, read, snack and craft – all in one! 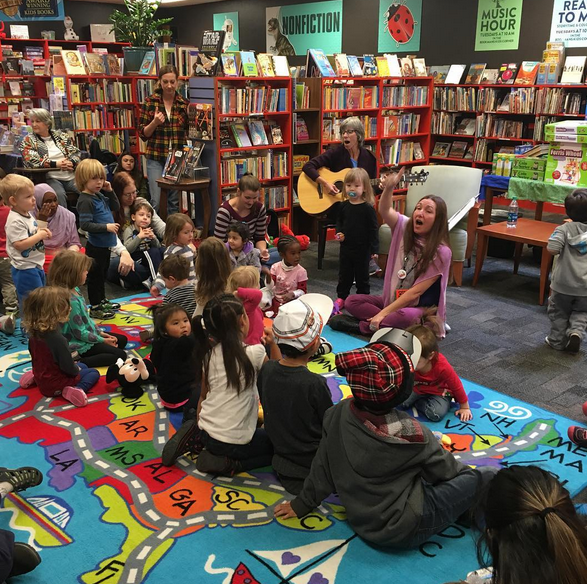 Bookmans East features Story Time Music Hour each Tuesday. Children of all ages are welcome to join the fun. Come and learn all the classic childhood songs, read and snack and wrap it up with a new craft each week. This exciting interactive event is fast-paced enough to keep all the little ones engaged. Children are encouraged to learn and explore in a safe, enthusiastic environment. Bookmans Northwest • Storytime • Thursdays at 10 a.m.
Storytime takes place every Thursday morning at 10 a.m. at Bookmans Northwest. Children are welcome to hang out and enjoy a few stories in a positive and affirming environment, as well as fun small song and movement activities and the creative art of coloring. We also provide snacks and a whole lot of fun! Bookmans Midtown • Storytime and Craft • Thursdays at 10 a.m.
Join Bookmans Midtown for Storytime and Craft! Every week we’ll be learning a new letter and reading together as we explore the world through books! Enjoy interactive storytelling as we sing songs and play games to help get your child ready to read. This storytime promotes early literacy, letter recognition and, most importantly, a love of reading. Bookmans Mesa • Miss Katy’s Storytime With Sign • Tuesdays at 10 a.m.
Join us each week for fun songs, stories, and sign language! Build bonding and language skills with little ones, essential elements of early literacy. Learn fun tips on how to make story time at home even more dynamic. Perfect for children ages 0-5 years with a favorite grown-up. Bookmans Phoenix • Story Garden • Wednesdays at 10 a.m.
Story Garden is an interactive storytime each Wednesday at 10 a.m. featuring our favorite storyteller, Mr. Eden of the Phoenix Public Library and First Things First! Hang out and have fun with music, books, games and more. Children of all ages are welcome and we encourage parents to participate. Every child will receive a free book each week. Come grow with us! Bookmans Flagstaff • Read to Me Storytime with Miss Kendra • Fridays at 9:30 a.m.
Join Ms. Kendra every Friday at Read to Me Storytime for fun with learning and letters. The intention is to help get your child ready for reading. Complete with songs, games, activities, and of course, books every Friday in the Kids’ Corner! All are welcome to attend any of our storytimes. Each storytime is carefully chosen to promote literacy. 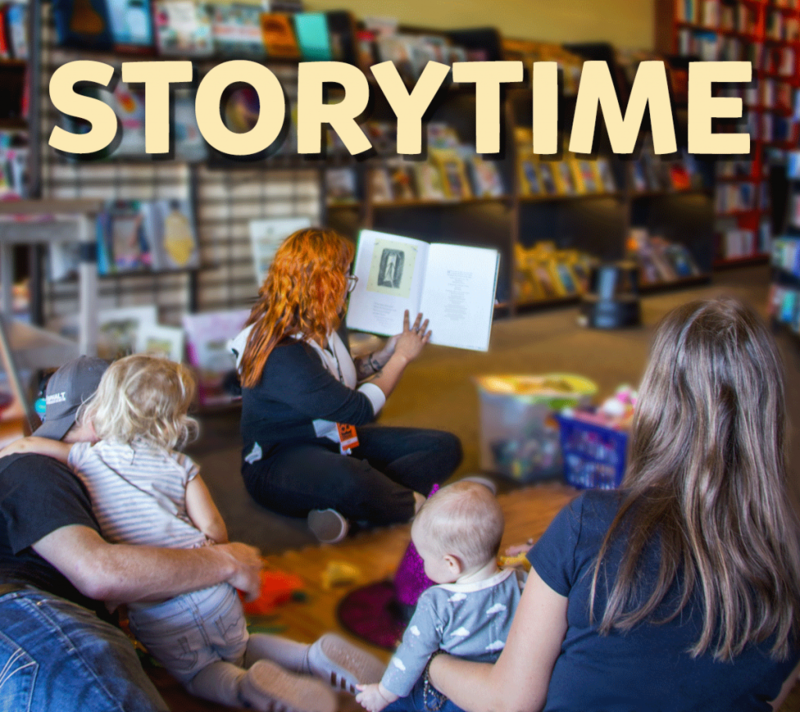 Be sure to take advantage of the awesome story times that Bookmans offers, we know you’ll have a great time. Also, check out our Kids Club program for children ages 0-12 that offers discounts on books. We look forward to seeing you! For the full schedule of all events around town and in our stores, please visit our Event Calendar.